BEIRUT Despite the supposed cease-fire that is occuring during a Muslim holiday, two deadly car bombs and sporadic fighting were reported in Syria, illustrating the difficulty of maintaining even a limited truce. Amateur video posted online showed debris scattered across a large area. Flames shot out of the car's gutted wreckage, as frantic residents tried to evacuate casualties. One rescuer carried a man with blood streaming down his face. Though violence in the country has significantly declined during the cease-fire, from dawn to dusk on Friday 62 people were killed, including 24 regime soldiers, according the Observatory. In recent weeks, the daily death toll usually topped 150. The truce, proposed by U.N.-Arab League envoy Lakhdar Brahimi and endorsed by the Security Council, is set for only the four days of the Eid al-Adha holiday, has no monitoring mechanism and no stated plans for its aftermath. Past cease-fire efforts have collapsed as both sides refused to lay down their arms. The first serious disruption involved a radical Islamic group, Jabhat al-Nusra, that rejected the cease-fire from the outset. The group clashed Friday with regime forces for control of a military base outside of a strategic town on the road to the northern city of Aleppo, according to the the Observatory. Fierce fighting has been going on there for several days and has killed at least four people. Clashes erupted over a military base outside the strategic town of Maaret al-Numan in the north, and five people were killed in government shelling and sniper fire in the Damascus suburb of Harasta, activists said. Opposition fighters seized Maaret al-Numan, which lies along the main highway between Aleppo and Damascus, earlier this month. Their presence has disrupted the ability of the Syrian army to send supplies and reinforcements to the northwest, where troops are bogged down in a stalemate with the rebels in Aleppo, Syria's largest city. Fighting also was reported in several other parts of the country as the day progressed, including the army reportedly firing artillery shells in several areas, including in Aleppo and suburbs of Damascus. The violence underscored the complexity of the situation, with the badly fragmented opposition sending mixed signals about the truce, some endorsing it and others rejecting it as irrelevant. The significant decline in fighting did allow protesters in Damascus and several other cities to pour into the streets in numbers not seen in 19 months. Thousands used the brief respite in the civil war to pour into the streets and demand President Bashar Assad's ouster. The Observatory said protesters rallied after holiday prayers in Aleppo, the central province of Homs and the city of Hama. Demonstrators also took to the streets in the suburbs of Damascus and the southern province of Deraa, where the uprising began. Three people were wounded when troops tried to disperse protesters in Deraa, the group said. In the Damascus suburb of Kfar Batna, Syrians waved rebel flags, cheered, clapped and in some cases danced to revolutionary songs, according to a video posted online. "May God curse your soul Hafez," they shouted in the Damascus suburb of Kfar Batna, in reference to Bashar's father and the late Syrian president, Hafez Assad. "Syria wants freedom," the protesters added, according to a video posted online. The videos appeared consistent with AP's reporting on the demonstrations in the area. Rebel commanders have also dismissed the truce as irrelevant. The short holiday cease-fire was the only thing a divided international community could agree on after the failure of a more ambitious plan for an open-ended truce and political transition talks by Brahimi's predecessor, former U.N. chief Kofi Annan, in April. President Bashar Assad's government accepted the truce but left significant loopholes, declaring it would respond to any rebel attack or attempts by foreign forces to intervene. Brahimi has not said what was supposed to happen when the truce expires on Monday, an ominous sign since Assad and opposition leaders disagree sharply on how to resolve the conflict. Assad refuses to resign, while some opposition leaders say his departure is a prerequisite for any political talks. 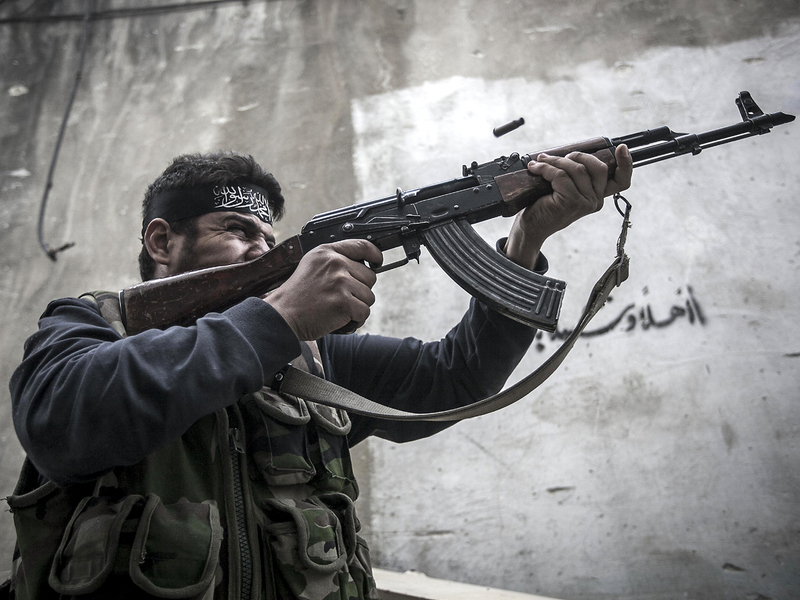 The fragmented opposition factions disagree over whether to negotiate with Assad at all. In Washington, State Department spokeswoman Victoria Nuland said the U.S. has seen violations on both sides but pointed out reports of attacks from helicopters and tanks. "These are weapons, obviously, that the opposition doesn't have," she said. If the truce holds, it would be the first actual halt in 19 months of fighting that began with mass demonstrations but has transformed into a full-blown civil war with sectarian overtones and tens of thousands of dead. Syria's state news agency said Assad attended holiday prayers in Al-Afram Mosque in Al-Muhajireen district of Damascus. The embattled president was shown briefly on TV, sitting on the mosque floor and praying. He was later seen smiling and shaking hands with worshippers. Assad has rarely appeared in public during the uprising. He was last shown on state TV Oct. 6, when he laid a wreath to mark the anniversary of the outbreak of the 1973 Arab-Israel war. More than 35,000 people have been killed, including more than 8,000 government troops, since the uprising against Assad began, according to activists.